Taking advantage of my heightened sense of color, I begin my abstract paintings by pouring acrylic inks & paints directly onto varied surfaces: handmade papers, canvases, digital photos and sheer Asian papers. As images begin to emerge, I may refer to photos, sketch books, or simply my imagination to develop the semi-abstract paintings that constitute the body of my work. Collections of collage papers found, purchased, and/or painted by hand may now be added to the surface of the work. It is at this point that the interplay of collage and paint begins. Trying to preserve the beauty of the original handmade paper causes works such as Japonisme II & III to be spare and carefully crafted. Other surfaces allow for a lot of “play” with the paint; I use combs, palette knives, and scrapers as well as brushes to work the paint onto the surface. Each piece, even if part of a series, such as the shopping bags or koi fish, is allowed to take off in its own direction in response to what occurs on the painting surface. I picked up a paintbrush nearly twenty five years ago because, as a Columbus Museum of Art docent, I was interested in learning more about how artists actually work. 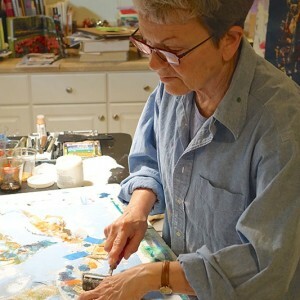 Finding an unexpectedly early success in showing and selling my work, I took classes both in art school and privately, participated in national and international workshops and used every opportunity to uncover the “Artist Within.” Originally a watercolorist, I soon discovered the multifaceted aspects of acrylic paints and inks, as well as the fun and textural qualities of collage. I had found my personal artistic style! A new phase of life since moving to Chapel Hill, N.C. is bringing my art into new homes and collections. The opportunity to participate in the annual Fall Studio Tour of the Orange County Artist’s Guild and to teach various students some of the techniques and ideas I’ve developed about the how and why of combining paint and collage keeps me experimenting, energized, and remembering that first watercolor class taken “just for fun” that profoundly changed my adult life.